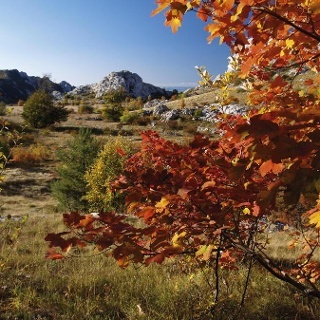 The area between Visočica and the peaks above Paklenica is not characterized by high peaks, and the key hiking destinations are oriented to the coastal side of the mountain. This is karst terrain, with an interesting series of several spacious karst valleys with virgin forests and large fields where the locals kept their livestock during the summer period until the second half of the 20th century. In this large karst area, particularly beautiful is the wider area around the karst valley of Stap, with the mountain shelter Tatekova koliba. Right above Stap, we come across kamen Čučavac – a stone that represents a genuine miracle of static stability – and the rocky peak Debeli kuk. South of Stap, one prominent peak is Stapina. With its unique and recognizable shape, it attracts the attention of observers from far away, resembling an impressive natural skyscraper from up close. The so-called Kamena galerija (Stone Gallery) in the area is a very picturesque phenomenon, resembling a labyrinth of rocks. 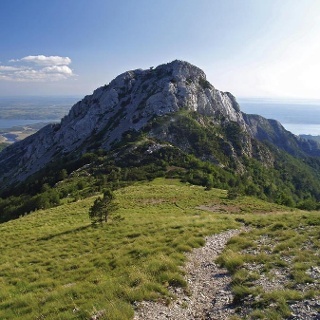 This is where Slavko Tomerlin, better known as Tatek – a renowned mountaineer from Zadar – prepared a demanding but very attractive loop trail for hiking through the rocks. The section of Via Dinarica from Stap to Struge overlaps with the route of the Velebit Hiking Trail, so orientation is not difficult. From the karst valley of Stap, the route first ascends to the base of the picturesque rocky peak of Stapina. Behind it, to the left, there is a trail branch leading from the Velebit Hiking Trail to the Stone Gallery. This magnificent rocky labyrinth can be visited along an attractive but demanding hiking trail in the shape of number eight. The Velebit Hiking Trail continues southwards, to the wide plateau of Malo Rujno, and then also to the plateau of Veliko Rujno with a chapel in the middle of the plateau. 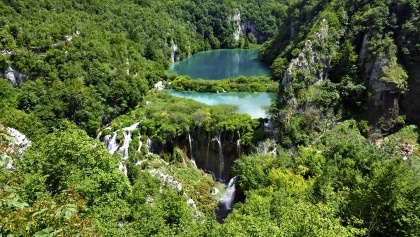 From the edge of Veliko Rujno, the trail starts ascending through the forest towards the pass of Buljma and towards the plateau of Struge, where there is a mountain shelter of Zadar mountaineers. It takes 7 to 8 hours of hiking to pass the section from Stap to Struge. Loved the "polje" Velike Rujno and Stapina is lovely. Struge is a popular place, many people there, but still (or because of that) a great place. Water is 20 a minute walk though.